알리타에 대해서 처음 들어보는 분들이 계시다면, 영화 아바타랑 타이타닉을 제작한 제임스 카메론 감독님과 제작진들의 새로운 작품이랍니다! 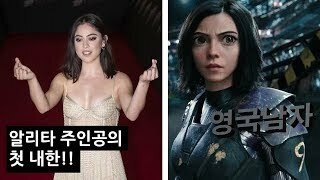 If you haven't heard of Alita yet, it's the next huge production to come from James Cameron and the digital studio behind Avatar and Titanic! Thanks to 20th Century Fox for setting up this interview and sponsoring next week's video. 이번 인터뷰 기회를 주시고 다음주 영상 스폰서 해주신 20세기 폭스에 감사드립니다.